Description: S-111 is an additive for aqueous alkaline systems. It provides excellent flash corrosion protection and corrosion protection at low concentrations for parts inprocess. It is ideal for cleaning of electronic metals, aluminum and ferrous alloys. 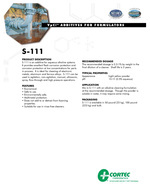 S-111 can be used in agitation, non-agitation, manual, ultrasonic, spray, flow-through and high pressure operations. Application: • Economical. • Safe to use. • Environmentally safe. • Multimetal protection. • Does not add to or detract from foaming properties. • Suitable for use in rinse-free cleaners. Package: 50 pound (23 kg), 100 pound(223 kg) and bulk.